The seventh season of HBO's 'Curb Your Enthusiasm' will premiere in the US on September 20. The announcement was made during the "Curb Your Enthusiasm" TCA panel in which creator/star Larry David revealed some details about the show's Seinfeld cast reunion. 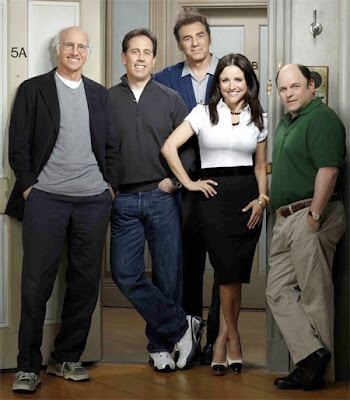 The "Curb" story line features the sitcom's cast members Jerry Seinfeld, Jason Alexander, Julia Louis-Dreyfus and Michael Richards playing themselves as they agree to a series revival. The Seinfeld cast will appear in five episodes that track the process of restarting the classic sitcom and picking up the characters lives 11 years later. "For years, I've been asked about a 'Seinfeld' reunion,","We'll see the read-through, parts of rehearsals, the show being filmed. You won't see the entire (mock 'Seinfeld' episode)." The Seinfeld reunion idea will be introduced a couple of episodes in and will be the main arc this season, which might wrap with an hour long finale.